Tactical knives are geared towards one purpose and usually do not deviate from said purpose. That purpose? Combat, hence their oft-used name “combat knives”, or “combat tactical knives”. These knives are designed for military use, and though old-fashioned trench combat has waned from modern warfare, the knives still come standard in every soldier’s kit. That is not to say that these knives are for military use only. There is indeed quite the market for civilian-owned tactical knives, and one of the most recognized names in the industry is Gerber, known for both their folding-blade knives as well as their fixed blade tactical knives. Gerber Legendary Blades was founded in Portland, Oregon in 1939, after years of selling handmade kitchen knives led to Abercrombie & Fitch requesting more knives to be sold in their catalog. Gerber is most known for pushing the technology they use in their tactical knives, consistently innovating the market. Their work is so groundbreaking to the tactical knives world, that in 1985, Gerber Legendary Blades was inducted into the Blade Magazine Cutlery Hall of Fame. Blade Magazine is a long-running consumer-geared tactical knives magazine, which specializes in coverage of all sorts of blades, the hobby of knives, as well as the manufacturing and legislation of all sorts of knives. Originally published with the title of American Blade, Blade Magazine changed its name in 1982 after being bought out by Bruce Voyles and Jim Parker. Voyles and Parker teamed together to do more than just purchase the magazine, they are true knife enthusiasts, as they formulated and launched The Blade Show, as well as the International Cutlery Fair, which is the largest knife event across the world to this day. Another big name in the tactical knives market is Strider Knives, a California-based custom tactical knives manufacturer owned by Mick Strider and Duane Dwyer. Strider Knives have collaborated with many other knife companies, as well as individuals, the most well-known being Richard Marcinko. Richard Marcinko is known to some as “Rogue Warrior”, a man whose life has been adapted into multiple books, as well as a videogame – this man obviously knows his tactical knives, and the fact that he chose to associate with Strider Knives for the Rogue Warriors series of custom tactical knives should speak for itself. All of these names are big in the tactical knives world, but quite possibly the biggest and most recognizable would be KA-BAR, the company who lends its name to and manufactures the same fixed blade tactical knives that the United States Marine Corps supplies to its Marines. KA-BAR also makes the USN Fighting Knife Mk. II, which is the tactical knife of choice of the United States Navy. KA-BAR’s name comes from the letter they received from a customer, praising their blade after he was able to kill a bear once his gun failed to do so. The only legible words or letters from the letter were “k a bar”, obvious that the man meant “kill a bear”, but the company picked it up as their trademark, and later, name. There is obviously a market for these combat tactical knives outside of the battlefield, be it from knife enthusiasts or collectors, or people wanting to use these finely crafted tools for something other than showing off. More recently, the tactical knives have come to be more survival tools than anything else, as they are able to hold up to the rough and tumble of anything you might need it for in a survival situation. Regardless of the dwindling number of knife-heavy combat situations, these knives have often saved many lives when guns have failed, and for that reason, they will always have a place in the world. Being stuck in any survival situation is not typically going to be your most pleasant experience and something you are going to go out of your way to place your self in (unless you are Bear Grylls). However, if I am stuck in a survival situation then there is definitely a few pieces of equipment I will be hoping I have with me, my survival knife and my Bear Grylls survival hatchet. 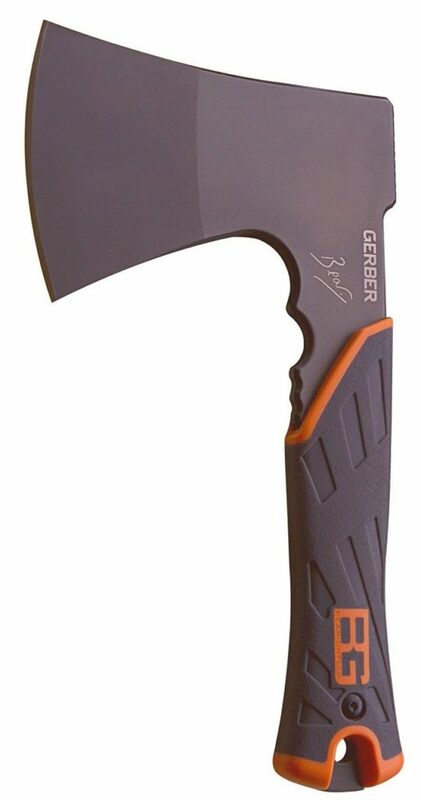 This little axe is going to really help you and is designed by the team at Gerber with the man himself to make sure that this axe really is the best survival hatchet out there. Although this is a really small hatchet (great for portability mind you) don’t let it fool you because this axe really does pack a punch. This is because a lot of the weight and power is concentrated on the head of the axe to give it that extra level of power that you will definitely be needing when trying to quickly build a shelter when it is bucketing down with rain. The blade on the axe is 3 and half inches long, making it a good size to not only limb saplings but to also split some bigger logs. 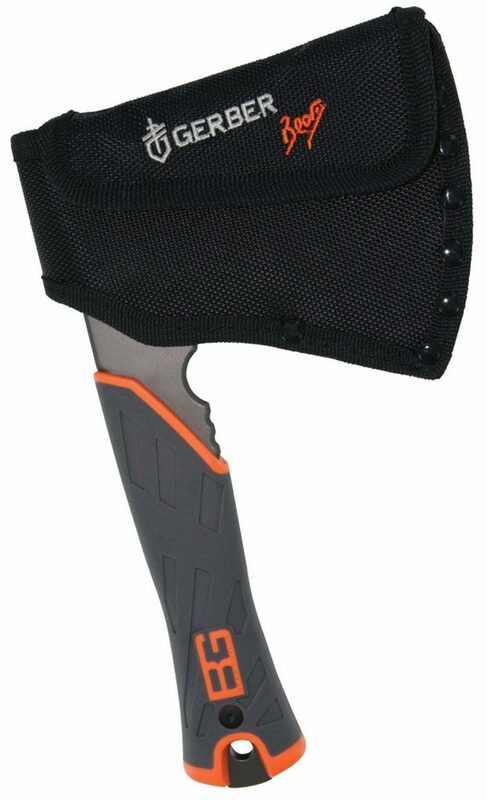 Better yet, as this is made out of 3Cr14MoV steel, the Bear Grylls Survival hatchet is going to be able to perform in any weather condition. On the back of the blade, it features a crosshatched striking surface that is really handy for different types of camp duties such as hammering in nails but also comes in handy in survival situations where for example you need to crack open nuts to get that bit of sustenance you have been searching for. Being a piece of survival equipment, you would expect the Bear Grylls survival axe to have a relatively good grip, and luckily it does. The handle is advertised to be a “zero slip grip” as it fills your hand allowing you to get a really nice and tight grip that you can be confident in using. This is also complimented by the fact that you are able to get a really solid grip even when its raining and you don’t have to be concerned with the axe slipping out of your hand. If you need, the axe also features some finger grooves near the head of the axe, allowing you to choke up and perform some more precise chopping duties. Overall, the Bear Grylls Survival Hatchet is my favorite little axe to take out with me. You will find a million and one uses for it and as it is incredibly light, its not going to weigh you down. If you are ever going out camping or what not, you should definitely take one with you because you really never know if you will be in a life or death situation and when you are, trust me, you are going to wish that you had one of these with you! Whenever you are watching some special ops movies and you see the main character go to town on the bad guys with this mean looking blade, they are probably using a Gerber Guardian (or something similar). The Gerber Guardian the first double edged blade I have got my hands on and the first one we are reviewing on this site! 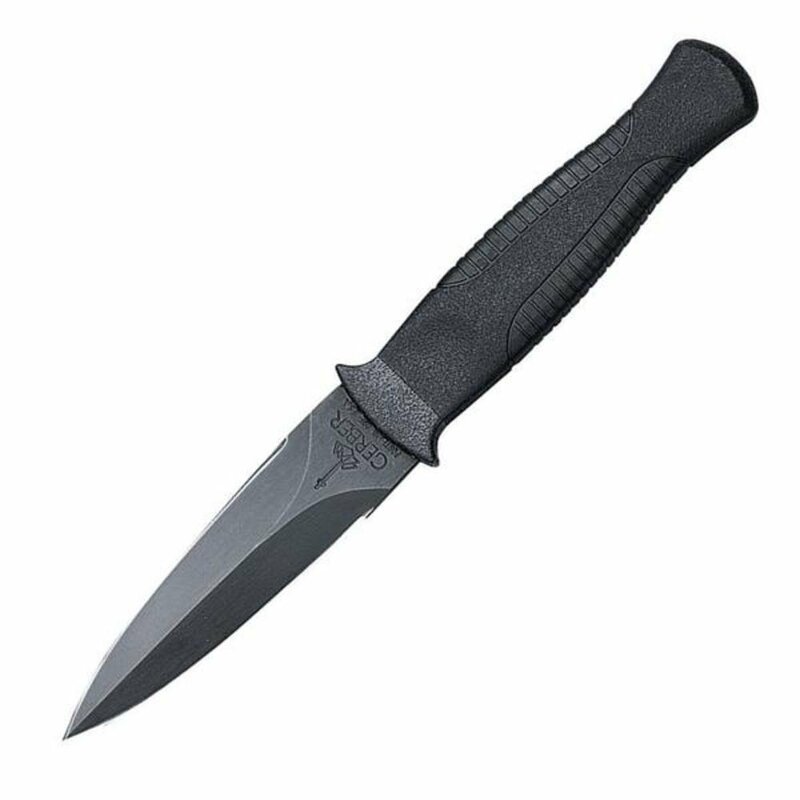 This awesome knife really makes you feel like some sort of covert ops when you carry it just because of its slick black color and professional handle, not to mention its deadly blade. If knives were people, I would say the Gerber Guardian would have to be Rambo. Overall, this is a brilliant knife and used by many service men and women defending our country overseas. One of Gerber’s most popular tactical knives for the last 40 years is the Mark II. This knife which was first introduced in 1966 has been making its “mark” (sorry for the pun, I couldn’t resist) on the knife industry since it was introduced and has been extremely popular, and for good reason too. This is a beautiful double edged blade, that not only looks incredibly tough but is incredibly tough. This got a fair bit of use during the Vietnam war although to date, it is still very popular amongst service man and women just because of the quality craftsmanship that each and every Mark II possesses. Gerber know how to to make high-quality knives and the Gerber LMF Infantry knife is a clear example of this. This famous knife has received absolutely raving positive reviews from nearly everyone who has bought this lovely piece of equipment. The knife was designed by former military man Jeff Freeman and was even field tested with troops in Iraq and Afghanistan, so I really think this knife is going to be able to easily perform any task you through its way. It is still even being used by service man and women in Iraq today and is proving time and time again, that Gerber really knows how to make a quality knife. Apart from looking great, this is one sturdy knife that is going to last you a long time and one you should really consider adding to your arsenal. Personally, I wouldn’t go camping or hiking without it. The CRKT 8900, (commonly referred to as the) Colombian River knife, is a tactical folding knife with a locking liner designed either with a razor edge or a serrated edge (8900 and 8900k). It has a tanto blade and pointed edge for piercing various materials. The bend in the handle provides a better grip for a small or a large palm. To provide better grip this blade handle is designed with scales. The cutting edge is pretty long and can be pierced into a tough surface. This blade also comes with a flipper, hence very easy and quick to open. It has a manual safety method in order to secure the blade from accidentally opening. The stainless steel lining prevents the knife from rusting away quickly. CRKT 8900 review’s on most other sites are very positive and looks like the vast majority of the people love using this knife. This knife has a very creative and innovative design. These knives are designed by Liong Mah, a Malaysian. Weight is somewhere around 5.3 ounces and very easy to use. The fit and finish of this knife are excellent and a very good deal for your money. The hands on feel of this knife are very much appreciated by most of the customers who buy them. The marvelous luster of this knife attracts all new users just by the look of it. The flipper moves the blade very fast in and out and people find it fun to play with these flippers. This knife is very comfortable for the forward and reverse grip because of the reverse tanto edges and sharp razor edges. It has a patented manual safety mechanism commonly called LAWKS so that your thumb can rest on something and can give you a better grip, whilst not opening at the same time. The best tactical folding knife will give you years of security, effectiveness, ease of use and peace of mind. Nothing compares to the feel of a secure blade and a firm but comfortable grip that provides maximum power. Tactical folding knives are meant to do damage and in fact, some of these kinds of knives are even illegal to own in some parts of the world. However, if you wish to own a knife that will protect you and will give you the winning advantage in case of an attack then only the best tactical folding knife is your choice. A tactical knife is in a lot of instances way smaller than its sisters knives. But, no matter how small it is, it embodies different uses that may come to be very helpful in a person’s daily life in the performance of activities where tactical knives may come to be a great use. For instance, it goes a long way in making life easier as it is a pocket tool that is able to cut and slice different materials ready for use. Also, it can be one form of defense should there be any criminal mind finding its way to make some move. With all these things in mind, here are some of the best tactical knives that you may consider each advanced in its own specific usage.